Update 2: Sweden prepares for political gridlock after an inconclusive election resulting in what may be month of uncertainty about the fate of the current government, even as Prime Minister Stefan Lofven said in a defiant speech he'll remain at least until parliament opens in two weeks, rejecting calls for his resignation. His Social Democrats will remain the biggest party, with their Red-Green coalition controlling 144 seats of 349, which however is a sharp drop from the 159 they received in the 2014 election; The Opposition alliance has 142. Meanwhile, the far-right Sweden Democrats improved to 63 from 49 four years ago, but fell short of expectations based on pre-election polling. Absent a major political breakthrough between the two ruling and opposition coalitions, the key events to watch next is December 24, when another snap election may be called. The krona was steady against the euro in early Asia trading, with some speculating that a short squeeze could send the currency higher as the election outcome was better than some of the worst-case scenarios that had been floated. Update: Sweden’s ruling center-left bloc managed to recover from its exit poll weakness and is now commanding a marginal lead over the center-right Alliance in Sunday’s national election with the unaligned, anti-immigration Sweden Democrats making gains. More notably, with 74% of districts counted, the Sweden Democrat lead has dwindled from just under 20%, and was now at 17.7%. It's still poised to climb from 12.9% in 2014, though. If these results hold it will be a bit of a relief for the Social Democrats, although as Bloomberg notes, getting around 28% would still be the worst result in that party's history. 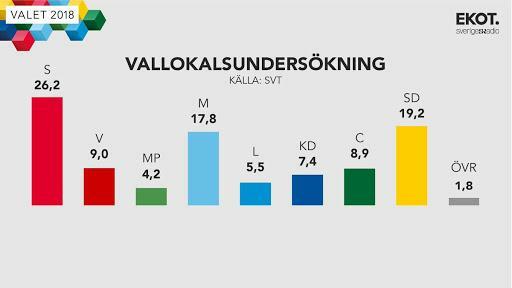 The first exit poll from Sweden's SVT is out, and while it has been deemed "too close to call", the initial results may present a headache for Sweden's establishment - and Brussels - as they show Sweden's four-party opposition with 39.6% of the vote, while the red-green block of government parties including the Social Democrats and Green and their Left Party ally, just behind, with 39.4% of the vote, a remarkable if expected decline from the 2014 election. Meanwhile, the nationalist Sweden Democrat party which has been the center of attention in this election, is said to be backed by 19.2% of the vote, largely in line with preliminary polling, and a 50% surge from the party's 12.9% result in the 2014 election, if below the 20% psychological level which many had kept a close eye on. If results hold, the Sweden Democrats would become bigger than the Moderate Party and be the second largest party in parliament. And while none of the established parties have indicated they want to work with the SD, it is becoming increasingly hard to ignore. Furthermore, as we noted earlier, analysts believe that 39-year-old party leader Jimmie Akesson will likely end up with some influence on policy. Ahead of the election, Akesson had promised to sink any government that refuses to give his party a say in policy, particularly on immigration. Meanwhile, in yet another disaster for Europe's establishment, the Social Democrats' result of 26.2% would be the worst since general voting started in 1921. And, as Bloomberg notes, it's pretty clear that the Alliance opposition would try to form a government with a result like this. As Bloomberg notes, Tobias Baudin, who is the head of Sweden's municipal workers union, Kommunal, tried to put a positive spin on the exit polls (his union backs the Social Democrats). "It’s clear that the biggest losers, if this result were to be true, are the Moderates. The Green Party is close to the threshold. But Stefan Lofven still leads the biggest party, the party that is trusted by most Swedes." So while we wait for the official results, it's going to be a long night in Stockholm. 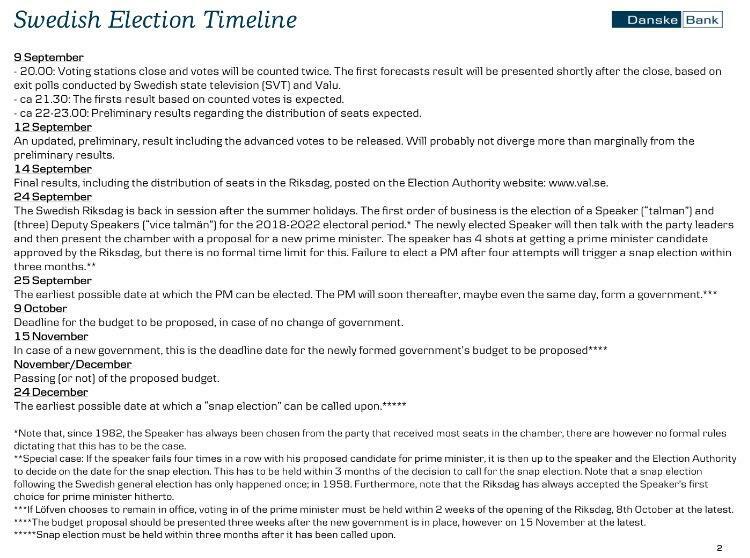 As a reminder, since for now it appears that there won't be a clear winner, in terms of what happens next, if Prime Minister Lofven doesn’t resign based on these results he will face a confidence vote in parliament two weeks after the election. Then, if he loses, the speaker will present a new candidate for prime minister to parliament. Historically, the speaker has never had to present more than one government alternative, the first proposal has always been accepted according to Bloomberg. Parties will have a maximum of four attempts to form a government, otherwise a new election will be held within three months. A new government, or a Lofven II-cabinet, will need to present a budget to parliament within three weeks of assuming office, Nov. 15 at the latest, while a budget vote will be held in December.